Running contests on your Facebook Page is an easy way to get new Facebook likes, email subscribers and sales leads for your business. We've seen amazing Facebook contest ideas succeed across industries with both our clients and for Wishpond. But sometimes it can be difficult to come up with Facebook contest ideas. An idea that will captivate your audience and get you leads interested in the products you sell. From experience we know the worst thing you can do is give away an iPad and expect a slew of interested leads in return. Anyone who entered would do so only for the iPad. No, we know that an ideal contest has to benefit your business and your fans. You need to have an idea that not only captivates your audience in a way that gets them to consider your products/services, but is also simple enough for everyone participate in. In this article I’ll give you 25 creative Facebook contest ideas that you can use to create highly engaging and targeted contests on your Facebook Page. Facebook Contest Idea #1: Tell Us How You Would Use [Product] to Win it! This Facebook contest idea is very simple: Take a product you sell and ask people how they would use it if they owned it. Push people to think about something fun, interesting or unusual they would use it for. You can then give the winner the product and have them send in a picture of them using it in the way they described: Giving you some bonus user-generated content. It gets entrants thinking about reasons to use (and thereby purchase) the product - making them more likely to purchase the product if they don’t win it. It creates tons of social recommendations (testimonials) for your products. If you use a Facebook contest app, like Wishpond’s Essay Contest App, to run this type of contest, you can utilize built-in voting on entries to determine the winner. Entrants will be propelled to share as much as possible with their friends to get the highest vote count. This will get each of their friends to read their recommendation of your product and pique their interest in checking out your products and business. A recent Forrester Research report found that 70% of US online adults trust brand or product recommendations from friends and family and 46% trust consumer-written online reviews, while just 10% trust ads on websites and 9% trust text messages from companies or brands. This makes each entry in this type of contest a promotion for your company that is 10X as effective as any advertisement you can run. Choose a product that’s easy to think of interesting uses for. The product should be fairly mainstream that most people would have a use for, so everyone can easily think of something. The more niche the product, the less people will know how to use it, and therefore enter. Advantage: A photo provides convincing proof that you recommend a company and its products, as you either need to have purchased a product/service from the company or have visited one of its locations. Disadvantage: An entrant must have already purchased your product/service or visited one of your locations, which is a high barrier to entry. 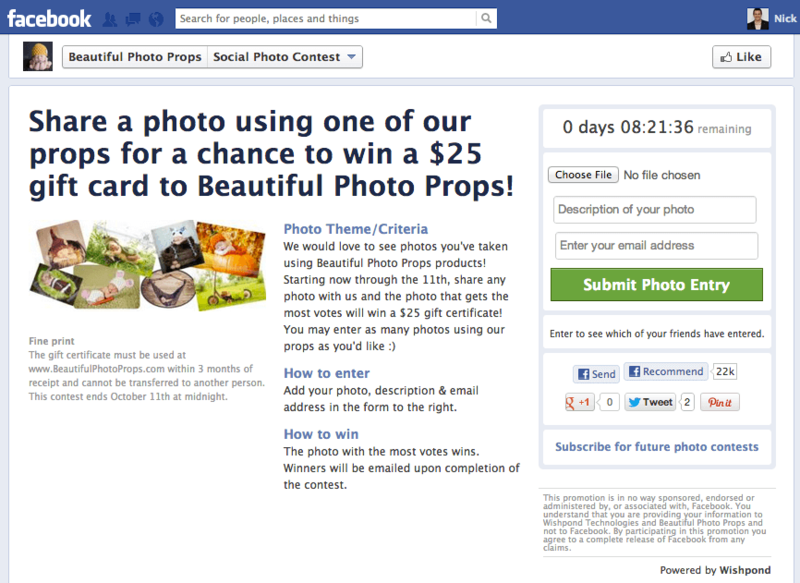 For this type of contest to be successful you need to already have a lot of customers and fans on your Facebook Page. Why? Only a moderate percentage of your customers will see or enter your contest. And to enter they need to take the time to take a photo of themselves doing something very specific. This again will decrease the number of willing entrants in your contest. To get a successful return on your investment (number of leads) from this contest, I would only recommend using this contest idea if you have at least 5,000 Likes on your Facebook Page. This will provide you with enough entries to make the contest engaging and entice people to share with their friends to get more votes than any other entry to win. If you have less that 5,000 Facebook likes don’t fret! I would recommend using Facebook contest idea #1: It will get you a ton of entries and product recommendations by making it much easier for people to enter. You can run this type of contest using a Facebook Contest App like Wishpond’s Photo Contest App. Just like with contest #1, you can utilize built-in voting on entries to determine the winner. Entrants will be propelled to share as much as possible with their friends to get the highest vote count. Provide images built into the contest design of people using the products or at your store location to give them ideas on how they can do it themselves. I’ve found that people truly enjoy this type of contest: They get to have fun thinking creatively about the product and get the chance to actually make a decision in a company. This second one is especially important for generating good will for your company, as people will see you as caring about and listening to your customers. Letting your customers name your product also gives you great insight into what they think about it, what they value about it and . The name they choose will reflect their first impression of what they think it does and what they think is its strength. This is a great way to build buzz around a new product: People will be reading about its functionality and benefits far more intently than if you showed them an ad. And they’ll be sharing about it with all of their friends to get votes for their entry. This is even a great way for new companies to generate initial buzz for themselves when they’re just starting out. 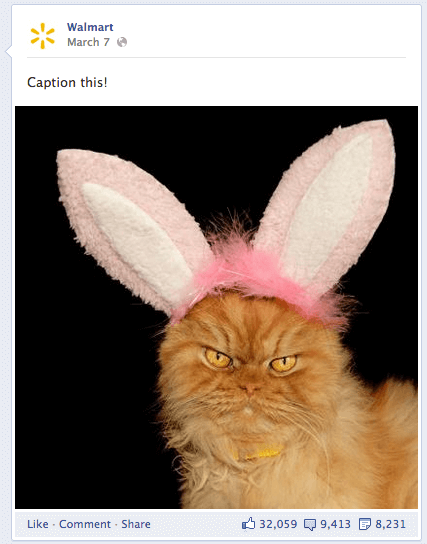 Facebook Contest Idea #4: Caption This to Win [Prize]! The rise of memes on websites like Reddit have made photo caption contests a popular way to engage fans. The basic premise is that you post a picture of something funny or outrageous and then ask people to write a caption (title) for it. A great way to utilize this to create buzz for your products is to include one of your products in the photo. Two great ways to create “photo caption contest” worthy photos with your products are to show an animal using it or to show a baby using it. These types of photos immediately make people chuckle and put them inside the mind of the pictured animal or baby to think about what they think the product is/does. This is one of the best facebook contest ideas to drive new sales. To run this contest you simply choose 2 - 8 products, display them on a page and allow people to vote on each one (Wishpond’s Vote Contest App provides a complete out-of-the-box solution for this type of contest). Include a title that reads “Whichever product gets the most votes will be 50% off next week”. When the contest ends post on your Facebook Page, and send an email to every person who participated, saying which product won and how customers can redeem the discount on it. This will get people sharing with friends to help their choice win and even start comment discussions about which product should win, and why. This will create new recommendations/testimonials for your products as everyone clamors to prove that their chosen product is the best one to vote for. Stitch Collective has built a niche for its business by completely crowdsourcing it’s product design through the use of voting competitions. It asks their customers to vote on which bag designs they should turn into real products to sell. Check out our case study of how they have used Wishpond’s Vote Contest App to do this. Provide an equal discount for all item. If the discount is higher on some items than on others, it will skew the results to those with the highest discount. This will minimize any discussion or engagement about which product is best, as people will focus purely on the price points. Who doesn't love new adventures? The promise of adventure is hard to resist especially in an age where new experiences provide highly shareable social media content. 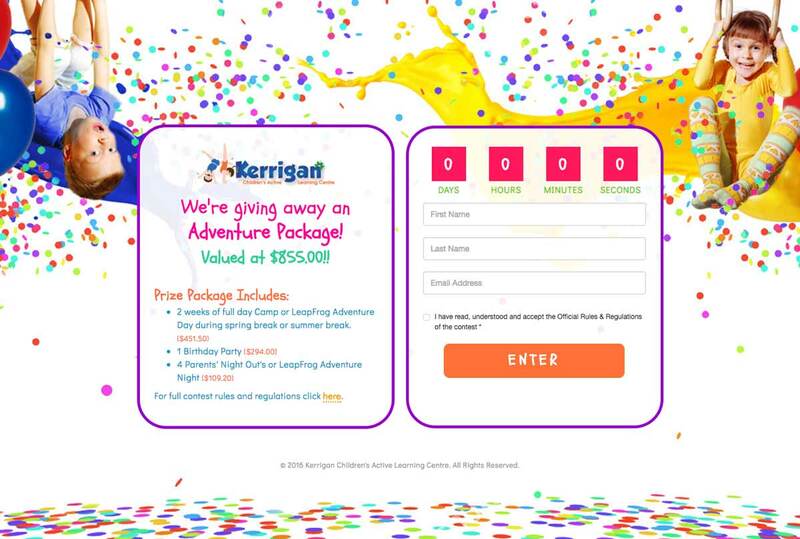 A children's gymnastic and activity centre gave away a massive adventure package in their Facebook contest. The prize package included a 2 week apss, 1 birthday party, and 4 nights out for the parents. What we like about this contest is the wide range of appeal of the prize. It was something both the child and the parent to enjoy. It was also a prize that allowed the customer to fully experience what Kerrigan had to offer. Let your fans have their say with this unique spin on a Facebook vote contest. 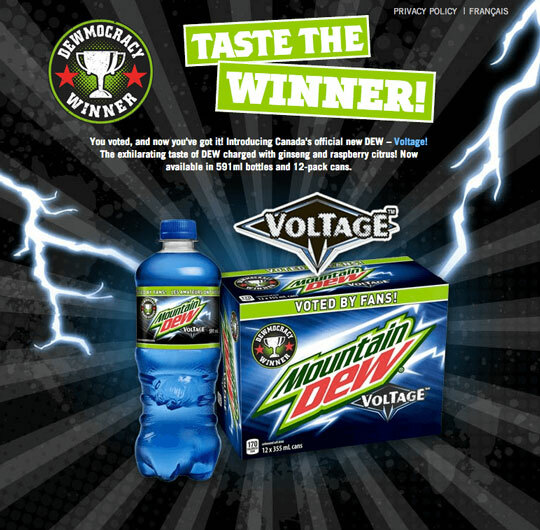 For this contest your fans will vote on their favourite product of yours. Once the contest is over, a winner is chosen at random to receive the grand prize. What makes this vote contest different is the fact that you win too. Having your customers vote on their favourite product is valuable data. It can help you decide what product to order more of or what to invest more in. Lisette L ran a Facebook vote contest to see what pair of leggings their customers liked most. The winning fan received their favourite pair of Lisette L leggings and $1000 in cash. Lisette L received invaluable data of the product their fans liked most which influenced their buying decisions in the future. Don't want to read this whole massive resource right now? Click here to download and save it as a PDF to read at your leisure! Do you market a digital SaaS type of product? Looking for more users and sign ups? Then a sign up and win is what you need. Reward those who sign up for your platform by offering a chance to win a free year of service. BitPages created a massive Facebook contest giving away a car to one lucky user. By signing up for BitPages you are entered to win. It doesn't get much more complex than that. It increased sign ups for the BitPages platform and garnered a ton of exposure in their industry. This is more of a tip than an idea but it's really worth mentioning. Update all of your creative assets across your owned properties. We see marketers forget to do this all the time. Once your Facebook contest is live change your cover images, pin a post about the contest, and update your links. It's the best way to let everyone who follows your business know you're running a contest. That way the contest will receive more exposure and be in a prime location to receive more shares. Amongst all the contests we run here at Wishpond, referral contests are one of our most popular. 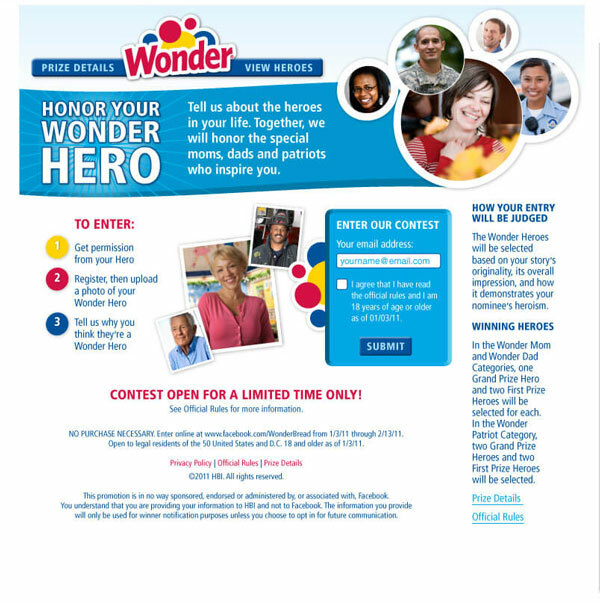 Not only do people enter the contest with their emails, they receive bonus entries by sharing the contest with their network. This type of contest leverages your followers and their network to help extend the reach. As long as you're offering a prize that your audience desperately wants to win you should have no trouble getting them to share it. 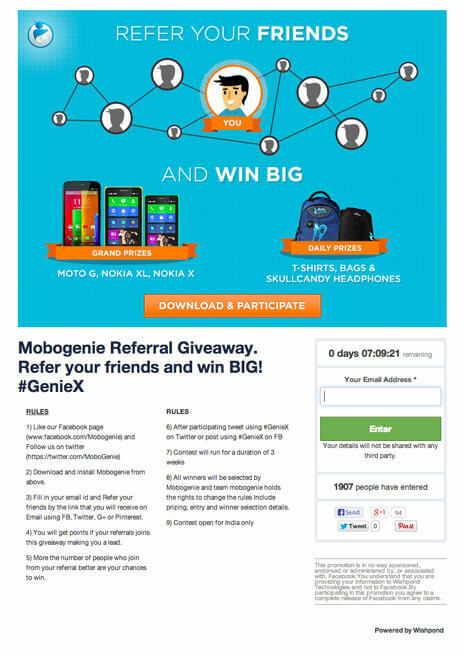 Mobogenie ran a referral contest just as I described and gave away awesome grand prizes that included cell phones, headphones, backpacks, and more. 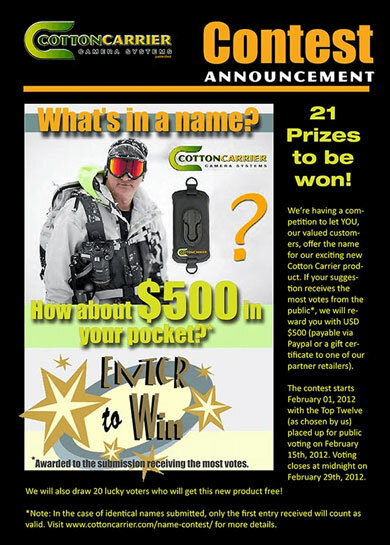 Entrants were encouraged to share the contest with as many people as they wanted to, to receive bonus entries and more chances to win. If you've had any experience with social media at all you've likely seen your fair share of selfies. Like them or not, lots of brands love leveraging people's selfie addictions. A selfie contest involves having participants enter a selfie under a certain theme for their chance to win. 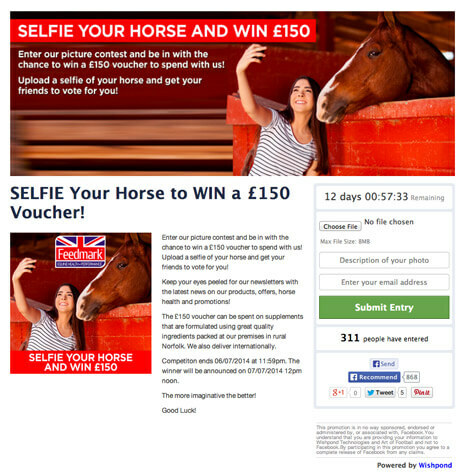 One of the sillier Facebook contest ideas we've run involved taking and sharing a selfie with your horse. Fun spins on a selfie contest like this can be adapted for any brand. Take a selfie with our product. Take a selfie at our store. Take a selfie of you doing anything! You get the point. Rather than submitting a photo this Facebook contest takes a different approach. For businesses looking to learn a little bit more about their loyal fans they can request story submissions. Wonder Bread wanted to learn more about the people who loved their product. They requested that fans enter the contest and upload a photo of their hero and tell their story. It gave Wonder invaluable insight into who their customers are and what things they value. If the rise of the UFC and mixed martial arts tells us one thing it's that people love a great battle. Pit two brands or products against each other and have your fans vote for their favourite. Seeing which wins out will give your business valuable data on the products your fans like most. 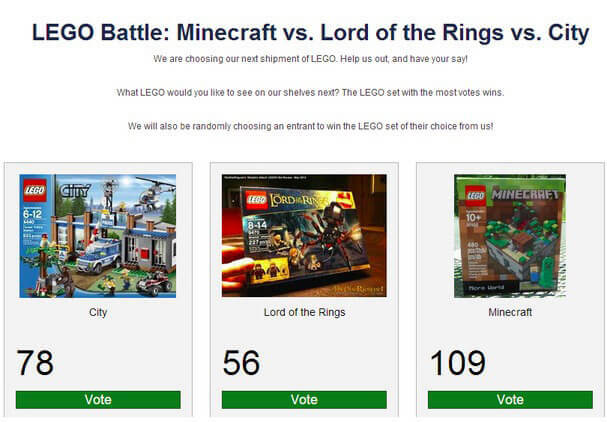 Lego did just that with a vote contest that pit Minecraft, Lord of the Rings, and Lego City against one another. Fans got the chance to vote for their favourite lego series and Lego got valuable data to use on their next production run. Pick a funny photo that involves your team and have your fans submit captions. This is all that's involved in a classic Facebook caption contest. 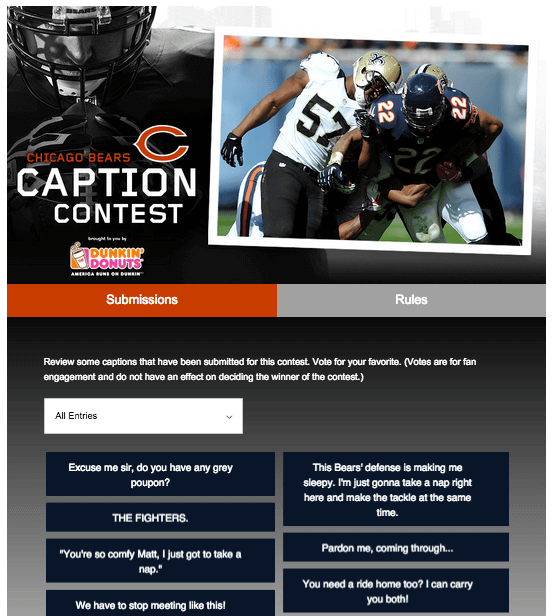 The Chicago Bears and Dunkin Donuts teamed up for a Facebook caption contest to engage their fans. Fans were asked to create and submit their funniest captions. All captions were posted on the contest page for everyone to see and vote on to encourage group participation. Tired parents everywhere rejoice every time September and the back to school seasons comes around. For those in the business of preparing students for the new school year a back to school themed contest works perfectly. 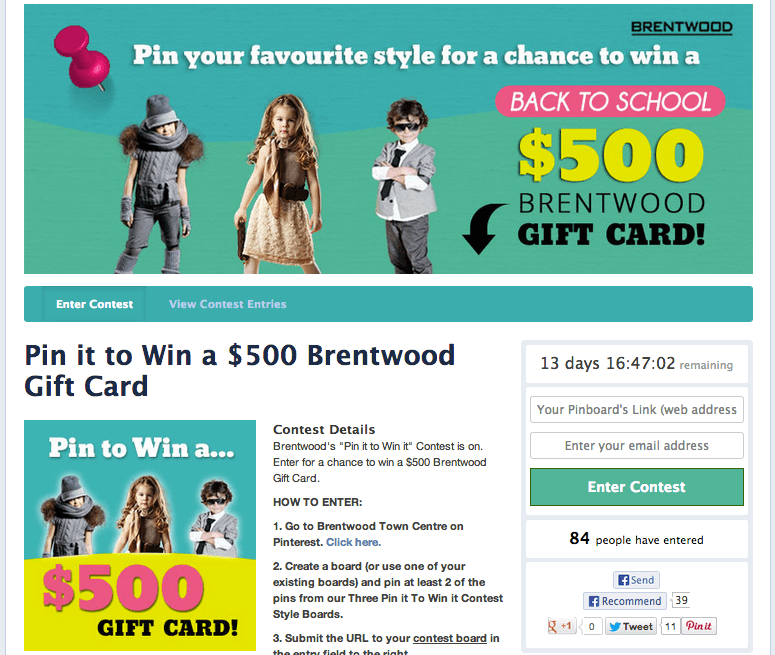 In anticipation for the new school year, Brentwood mall ran a back to school contest. For the contest students were asked to submit their freshest school outfit photos for a chance to win a $500 gift card. Do you sell products, goods, or accessories that your customers use everyday? Find out just how your customers use your product with a daily driver photo contest. 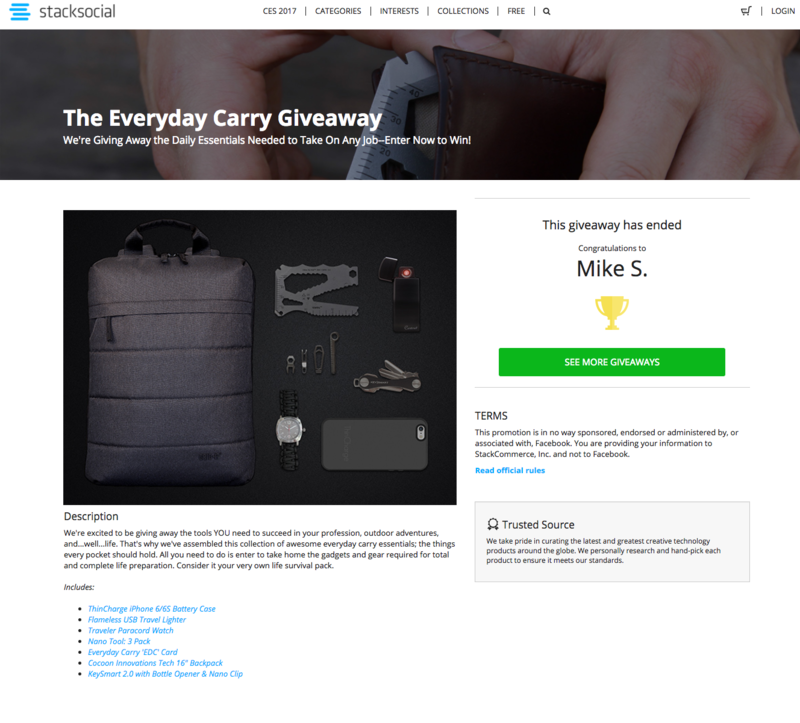 In the example below the blog EveryDayCarry hosted a contest to see what setup their readers used on the daily. Fans would submit photos of their every day carries and be entered to win an awesome gadget prize pack. Don't leave all the creative work to your designers, let your fans have a say. 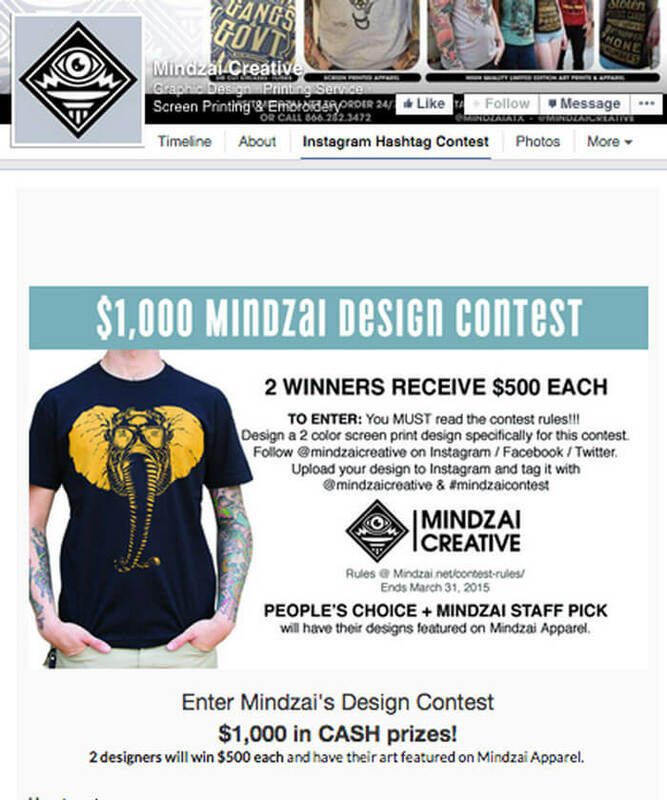 Mindzai hosted a design contest to let their fans become the designers. Fans could submit their t-shirt designs for a chance to win $500 and have their art featured on Mindzai apparel. Mindzai also made it a requirement to have participants follow them on Facebook and Instagram. Is there a major sporting event happening in the near future? Sporting events that draw massive attention are perfect opportunities for Facebook contests. 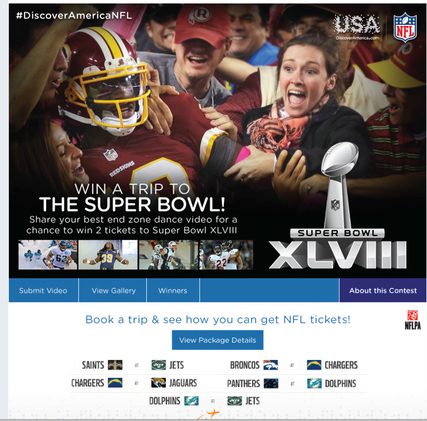 Like they do every year, the NFL used Facebook to give away tickets to the Super Bowl. All fans had to do was submit a video of their end zone dance for a chance to win free tickets to the Super Bowl. Facebook Contest Idea #19: How Do You Use It? As much as we like to think we know, our fans don't always interact with our business in ways we think they do. They might use our products in a different manner for example. REI ran a Facebook photo contest to see just how their customers are using their products in the great outdoors. 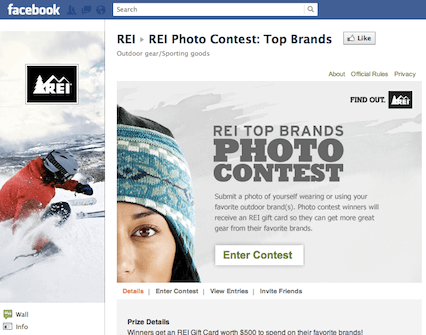 The winner received a REI giftcard and REI got some great user generated content in return. Not to mention some insight into how their products were being used in the real world. Facebook Contest Idea #20: What Type Are You? You shouldn't be surprised to hear that not all your customers are the same. They all have different reasons and stories for why they chose to do business with you. If you're interested in finding out the "why," (which you really should be) a Facebook contest can help. 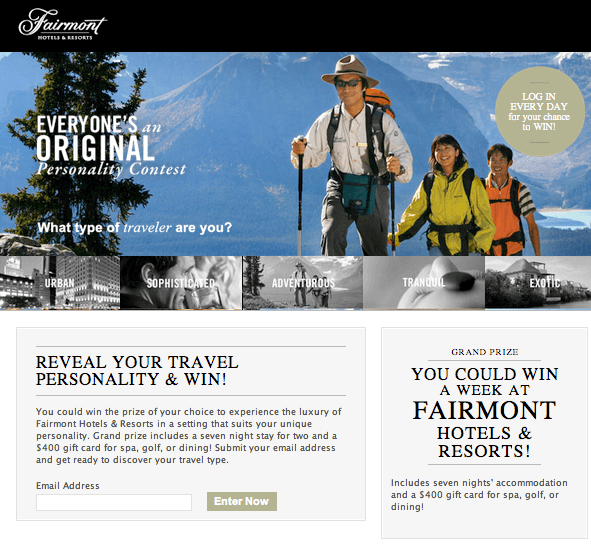 Fairmont Hotels & Resorts used a Facebook contest to find out a little bit more about their customers. They wanted to find out what type of travelers their customers were so as to serve them better in the future. Contests like these that produce valuable data and delight customers in return are our favourite because they're a win for the company and the consumer. 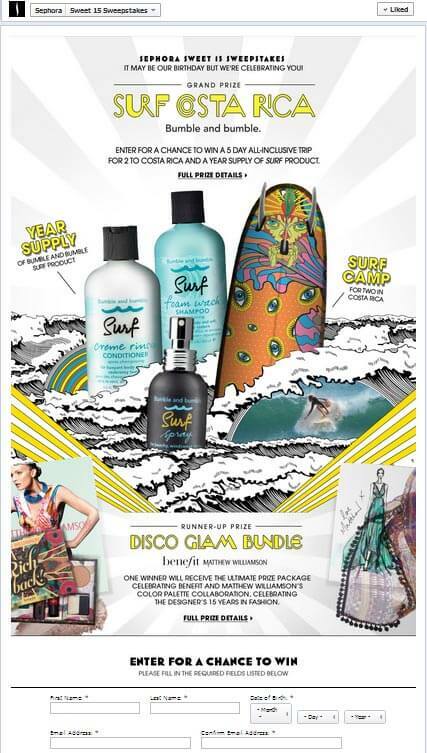 Worldwide beauty powerhouse Sephora ran a contest to celebrate summer and their line of surf themed beauty products. Winners received an all-inclusive trip to Costa Rica and a year's supply of surf product—not too shabby if we do say so. Up until this point you should understand the benefits of a Facebook contest. But you might be thinking, "I don't want to put in all the work and spend money on a prize." A legitimate concern for many businesses. But what if I told you it doesn't have to cost much money OR take up much time? This type of contest cuts things in half. Team up with a partner company to run yourselves a co-promotion. Split all the production work, prize, and promise to share the leads when it's all over. Each company commits to half the prize (e.g., a gift card or a free one-year membership) then both companies actively promote it. It adds twice the promotional power and results in twice the number of leads you would receive otherwise. 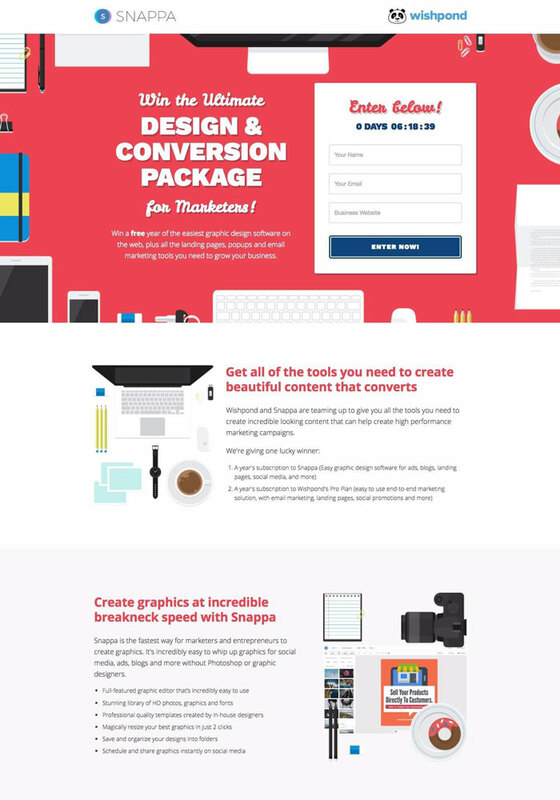 We recently did one ourselves and teamed up with the graphic design app Snappa. The prize was free subscriptions to both Wishpond and Snappa, and we both promoted it to our networks. At the end the leads were shared, a huge success by our standards. Outstanding results like our partnership with Snappa have us always on the lookout for more co-promotion opportunities. No not to the level of America's Next Top Model… but similar. If you're looking for a brand ambassador or need some pretty faces to help rep your business, turn it into a Facebook contest. Dove and their "real beauty" campaign was looking for their next model to be the face of Dove in Shoppers Drug Marts across the country. 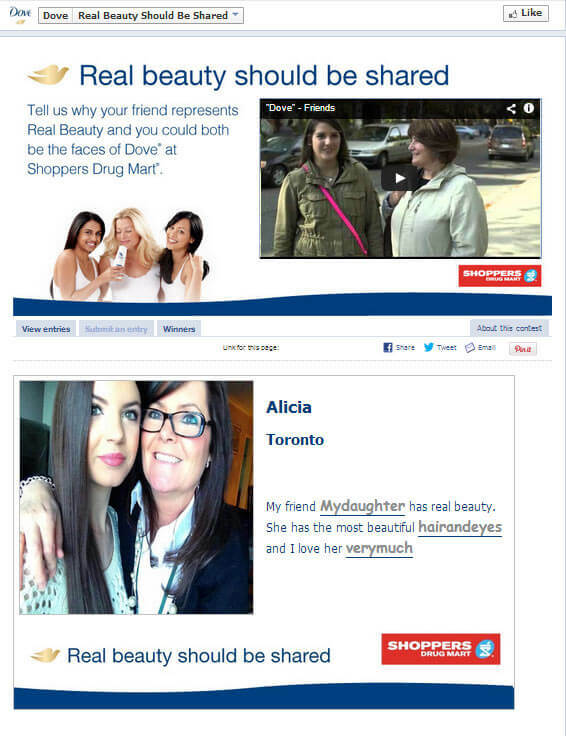 Participants were asked to submit photos of their friends and tell Dove why they represented "real beauty". The winners received a boatload of Dove products and became one of the faces of Dove marketing. Trying to drum up some creativity for your next product launch? Like we've seen before a vote contest is a great way to drum up some input from your fans. 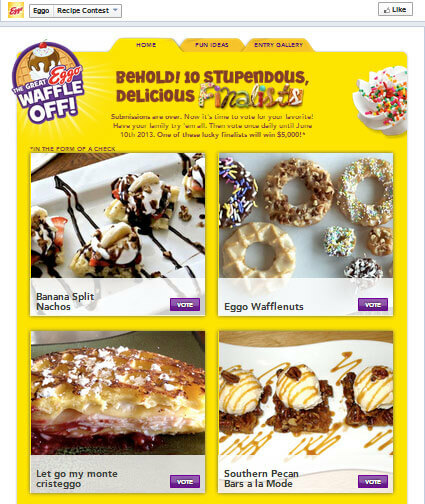 Everyone's favourite out-the-box waffle brand Eggo, ran a vote contest to see which recipe should come out on top. The contest was meant to create some user generated content and build hype around a brand that could use some excitement. Judging by the mouth watering food photo submissions we'd say the contest was a huge success. In the list of reasons to run a Facebook contest you'd be hard pressed to find a better one than a business anniversary. A one year anniversary is the perfect time to recognize your accomplishments and reward the customers who helped get you there. 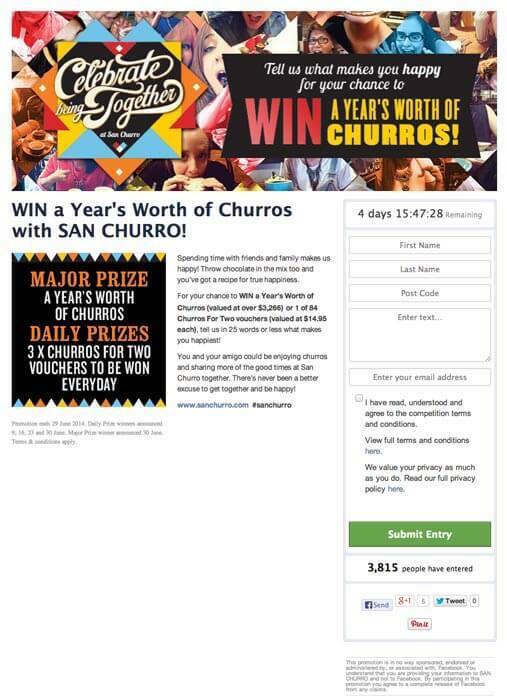 San Churro jumped at the opportunity to celebrate their milestone with their audience. They gave away a year's worth of churros to the lucky winner (gasp!). Inline with the theme of the contest, participants also were asked to tell San Churro what makes them happy. Perfect content to use in the future when sharing stories about their customers. Facebook contests are a great way to drive new, targeted leads for your business in short bursts over a long period of time. If there's one thing I'd like you to take away from this article, it is to think of creative ways a Facebook contest can be beneficial for your business and your customer. That could mean collecting user generated content, surveying your fans, or finding your next hit product. The opportunity for a Facebook contest to help your business is boundless. Over the long-term these types of contests are meant to develop the relationship you have with your customers. Engaging with them is a great start. Regular interaction with the folks who love your brand is vital and overtime it builds trust. And as we all know trust is what leads to lifelong customers. Are you looking to run a Facebook contest? Or if you've already run one, what was your experience like? Click here save it as a PDF to read at your leisure!